Developers of the Fallout 4 mod Rise of the Great Khanate (Wyoming). Feel free to introduce yourselves here and share whatever you feel like sharing so that we can get to know a little about one another! I am gonna go first. I am relatively new to modding but i am very passionate and determined to learn more and see this project completed. On this project, i will be mostly working on exterior landscaping but i will act as a jack of all trades to fill gaps in the development circle. Other than that i am a simple man, i love dogs, beer, sailing, binge watching tv shows and playing video games. Hey everyone! I'm Falkbeard and I'm from the mystical country called Scotland where we experience 4 seasons in one day lol. I am 22 and hopefully will be contributing to the 3D development side of things along with texture work. Im super eager to get involved and will more than likely push my beak into everything on here to get discussions going. I can/will be on the forums everyday as I have a 4 month old little demon girl to raise haha! Greetings for the great bread land . I'm Calderiaän , a young french guy who decided to join the team as a concept artist . Also knows as "ospreyhawk" on ModDB , I love the fallout universe and I always wanted to join a project like this . So , even if my English and my drawing skills are far from perfect, I'll do my best to bring you good content . Hey falkbeard, welcome aboard. Love your avatar btw, chaos theory! Calderiaän, welcome mate! You're being far too modest, your drawing skills are beyond perfect! I see this as both an opportunity to both hone my skills as a writer and contribute to a great mod project! Your morning is our evening (at least in my case)! Welcome aboard Primnull, thank you for joining us! Feel free to have a look around the forums to get an idea of what we're doing with the development. Feel also free to join in on the conversations and share any ideas, opinions or concerns that you may have! For any questions or anything that you may want to say, you can open a thread or pm me! Welcome to the team mate! My name is Chris and I work with sound. Music, sound effects, dialogue, foley, anything like that. I don't have any experience with the Fallout 4 Creation Kit although I have worked with Unreal 3 & 4, wWise Technologies, and like programs. I'm here to make this project sound good! Nice to meet you all. I'm from the East Coast of the USA and have been doing audio work for the past four years. I'm here to help with coming up with our storyline and sidequests, and hopefully help photoshop/draw a few ways I think things should look like. I'm from the Pacific Coast, am a senior in high school, and just finished up my AP tests so I have plenty of my time, and I can't wait to help! Welcome aboard lads! It will be a pleasure to have you on board! Puggsly here. Willing to work on interior/exterior design, V.O., or whatever is needed. Likes long walks on the beach and massacring muties makin' mods. hey puggsly welcome to the team! It's been about a fortnight or so since Atlas1080p introduced me to the mod project, so I'm sorry that I took so long to make a profile here and introduce myself to you guys. I'm a 3D modeller. I also fancy myself a bit of a writer as well, but for the moment my focus is solely on standalone weapons, armors, clothing, outfits, power armor and pretty much anything you can think of that a player can use. I keep myself busy with a lot of modelling projects and work for modding, but I just want to say that I look forward to working on this mod with you guys. I may not post that frequently, but usually when I do, it'll be to show a update on what I'm doing. 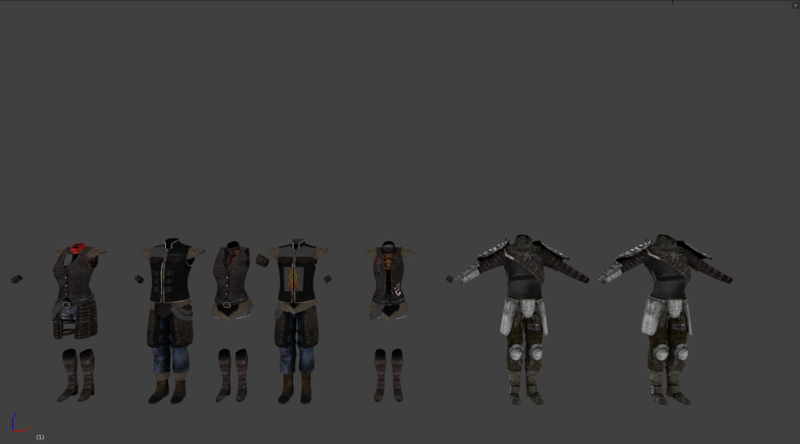 So for starters, here's a screenshot of the Great Khan outfits from New Vegas, including the unused armor for Papa Khan that was cut from the game (don't mind the grey patches, those are just there because I haven't enabled the Alpha transparency yet). These will be the bases for the new outfits I want to make, and as well as that I'll always be using references from Mongolian armor and clothing as well as clothing from Mad Max, since the Great Khans are very Mad-Max inspired like most raider tribes are.